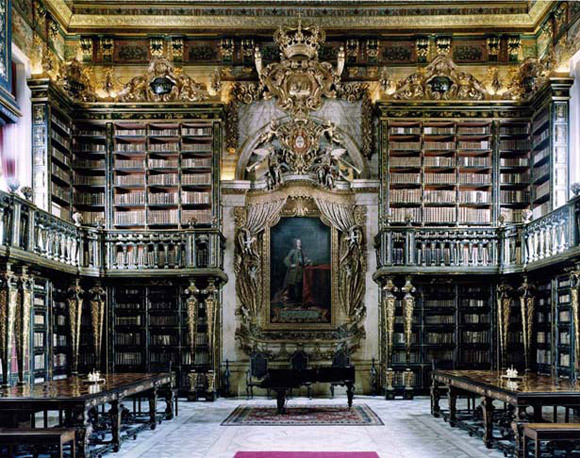 Candida Höfer, Biblioteca Geral da Universidade de Coimbra IV, 2006. C-print 80 1/2 x 97 3/8 X 2 3/8 inches. Artspace is pleased to present Library Science, an exhibition curated by Rachel Gugelberger, Senior Curator at Exit Art, New York. Bringing together a selection of work by 17 international artists, Library Science contemplates our personal, intellectual and physical relationship to the library as this venerable institution—and the information it contains—is being radically transformed by the digital era. Through drawing, photography, sculpture, installation, painting and web-based projects, the artists in Library Science explore the library through its unique forms, attributes and systems: from public stacks to private collections, from unique architectural spaces to the people who populate them, from traditional card catalogues to that ever-growing “cyber-library,” the World Wide Web. The desire to collect information in the form of a library dates back to Sumer (modern-day Iraq) in the 4th millennium BC. Gutenberg’s printing press (c. 1440), Xerox’s copying machine (1959) and the World Wide Web (1991) have all played a critical role in the dissemination of information. As the digitization of books continues apace—Google’s mission, for example, is “to organize the world’s information”—how the traditional library ultimately adapts to the digital age remains to be seen. Until then, as Library Science reveals, the library remains a fertile site for exploration and discovery, even if none of its books are opened. New Haven boasts a large number of notable, unconventional and historic libraries. In conjunction with the exhibition at Artspace, Connecticut artists were invited to submit proposals for research residencies towards creating site- and situation-specific projects at local libraries. Selected artists are: Colin Burke (The Whitney Library of the New Haven Museum), Heather Lawless (The New Haven Free Public Library), Andy Deck & Carol Padberg (Sterling Memorial Library at Yale University) and Tyler Starr (Robert B. Haas Family Arts Library at Yale). An exhibition at The Institute Library, timed to open with Library Science, features a series of library-based portraits by Meredith Miller and Rob Rocke. All participating institutions are in walking distance from Artspace. In conjunction with the exhibition, the Library Science Film Festival—taking place at libraries throughout Connecticut and presented in partnership with the Connecticut Library Consortium—features documentaries, independent films, Hollywood classics and television episodes in which the library plays a significant role. The online catalog features essays by curator Rachel Gugelberger; Jennifer Tobias, Reader Services Librarian at the Museum of Modern Art; and Andrew Beccone, founder and director of the Reanimation Library. Launching November 10, 2011, at www.libraryscienceexhibition.org, the online catalog also contains images, artist information and a regularly updated schedule of events. Library Science is generously supported with funding from the Andy Warhol Foundation, the National Endowment for the Arts, the David T. Langrock Foundation and a Strategic Initiative Grant from the Connecticut Commission on Culture and Tourism. Artspace is New Haven’s largest independent visual arts venue, showcasing a mix of local and national artists in a downtown corner storefront in the historic Ninth Square district. Our mission is to catalyze artistic efforts; to connect artists, audiences and resources; and to redefine art spaces.